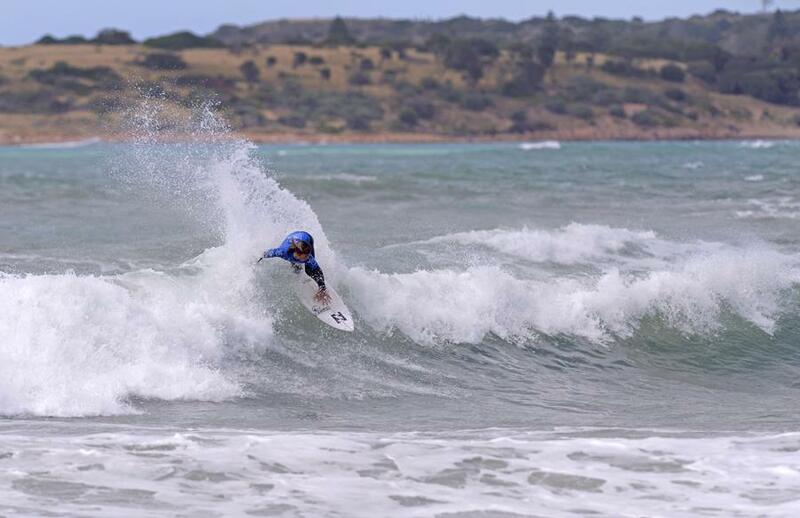 MIDDLETON BAY/SOUTH AUSTRALIA(December 2nd/2018): Day one of the 2018 Surf Dive ‘n Ski Australian Junior Surfing Titles saw round one of both girls and boys Under 16 and 18 divisions completed at Middleton Bay in South Australia. The shifty Middleton sandbank and strong winds made for challenging conditions as a forecasted rise in swell came to fruition throughout the day. In the Under 16 Girls it was Ellia Smith (QLD – 14 point heat total) and Charli Hurst (NSW – 11.40 point heat total) who top scored whilst Marlon Harrison (QLD – 11.90 point heat total) and Zeph Lamperd (VIC – 12.65 point heat total) highlighted round one of the Under 16 Boys division, maximising their opportunities in predominantly left-hand head high waves. Queenslander Taj Stokes and Victorian Taj Sleeman made their intentions clear in round one of the Under 18 Boys, posting 14.40 and 14.20 point heat totals respectively to put the rest of the field on notice. Molly Picklum (NSW – 13.50 point heat total) and Holly Williams (QLD – 11.50 point heat total) were standouts in the Under 18 Girls division as the swell and wind increased after lunch. School Sport Australia Allstars divisions also got underway on day one, capping off an action-packed first day of the event. With a joint National Titles encompassing Individual (Under 14, 16 and 18 age groups) and Australian School Surfing Association (Allstars and MR Shield) disciplines in both boys and girl’s divisions, the event is considered the benchmark of junior surfing in the country. With past winners including World Champions Steph Gilmore, Chelsea Hedges, Mick Fanning, Joel Parkinson, Mark Richards, Tom Carroll and Damian Hardman, a win in this year’s event is a legitimate stepping stone to world stage glory. The 2018 Surf Dive ‘n Ski Australian Junior Surfing Titles are proudly supported by City of Victor Harbour, Woolworths, 2XP Sunscreen, Hydralyte Sports, Air Asia, Hyundai, Hurley, School Sport Australia, Sport Australia, Surfing South Australia, School Sport South Australia, Surfing Australia and mySURFtv. Tuesday 4th December – Saturday 8th December, 2018: Contest period for the Under 14’s Boys and Girls Australian Junior Titles divisions.